“A commanding view of your test-coverage”. 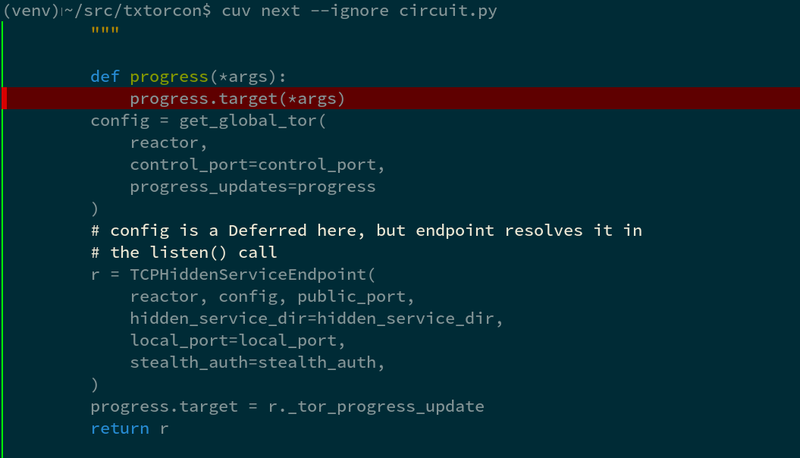 The tool cuv provides console tools to show coverage data for you Python project nicely in the console. It uses colour and unicode characters. Console graph of each file's coverage. --help: Show this message and exit. Syntax + coverage highlighting in console. You may need to provide the full path to 'cuv'. Now, whenever you'less' a file within a project that has coverage data, it will besyntax-highlighted and coloured according to coverage. Color a diff by its coverage. This prints out the whole diff as you would expect, but any added("+") lines in the diff get a red background if they are notcovered. Display the next uncovered chunk. ..which means you can keep pressing 'n' to see the next uncoveredline. If you include an argument, only files with that arg in thename are considered as "next". Single-line terminal graph of coverage.